Grant and Erin will be teaching simultaneous courses at Cleveland Institute of Art. Grant's course will focus in hot glass sculpting in the hotshop, while Erin's course will focus on flameworking. Collaboration between the two studios is encouraged! Learn how to create botanical works on the torch using both borosilicate and soft glass. This class will explore the differences between the two types of glass, including the benefits and limitations of using each on the torch. Students will learn basic techniques for constructing leaves, flowers, vines, and other flora. Assembly techniques, including bridging, will be covered. Through collaboration with Grant Garmezy’s sculpture class in the hotshop, students may learn how lampworked components can be brought into the hotshop and assembled onto furnace-blown pieces. 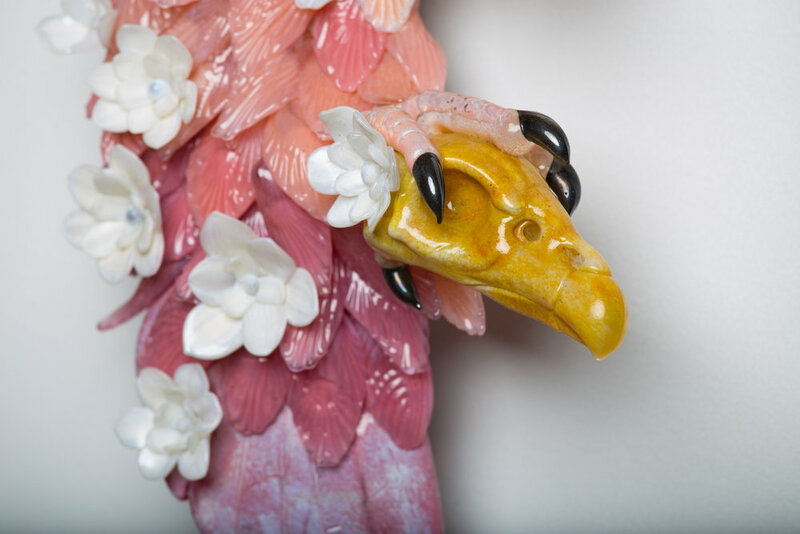 Explore the potential of working with hot glass as a sculptural medium. This class will focus on special techniques and approaches to solid and blown sculpting that can take your work to the next level by demonstrating the range and freedom the material has and showing its true potential. We will bring sculptures to life using a variety of torches and sculpting techniques, which include solid sculpting, inside sculpting, bit building, color application, garage use, and most importantly, teamwork. Problem-solving will be emphasized. You are encouraged to bring in images of forms you are interested in creating.